I always enjoy visiting the Avatar Acoustics room as their owner is a real gentleman and presents himself and his products with the utmost professionalism. The combination of Feickert Blackbird turntable, Feickert DFA 10.5 tone arm, Lyra Cleo cartridge, AMR PH-77 phono stage with AMR AM-77.1 integrated amp, ASI Liveline cables and Rosso Florentino Volterra loudspeakers sounded great on pop (Staple Singers) and rock (ZZ Top) LPs. The system exhibited all of the drive and weight needed for rock, which too often cannot be said of many high-end/high resolution systems. Also of note were the clear ruler markings inscribed on the turntable plinth for ease in setting up different tone arms. This would be great to have for tone arm reviewing. My friend Bill got transfixed in the TT Weights room which displayed a bevy of turntables at various price points. I believe the Gem rim-drive turntable was being played when we entered the room going through Allnic electronics into the Silverline LaFolia speakers. I had trouble concentrating because my other friend Roger was blabbing with designer Larry Denham about machining and bearings etc. Bill was in a better seat and came away highly enthused, proclaiming later that it was his favorite room at the show. I was able to pick up on the excellent detail and dynamics in this demo but must defer otherwise. 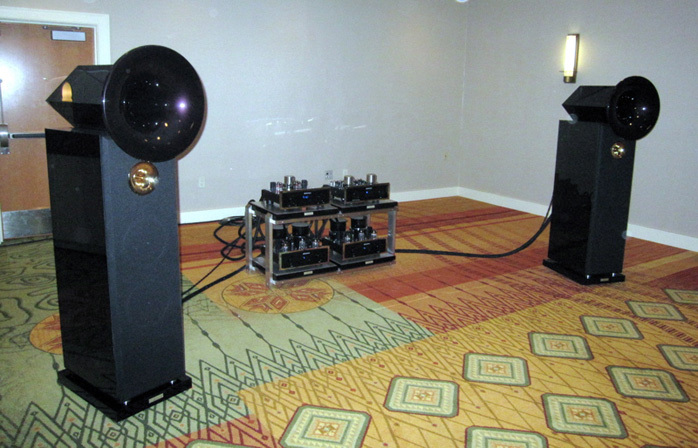 A speaker I had never heard of before, the Kaiser Kawero was sounding absolutely gorgeous in room 477. The electronics were by German manufacturer GTE and called the Trinity series. Cables were by Armonico from Fono Acustica. The speakers were a three-way design with reflex-loaded midrange and woofer. Highest quality parts included Dueland CAST and Mundorf silver/gold/oil caps and a Serbian Raal ribbon tweeter. The sound was very sophisticated, combining refinement, smoothness and a rich silken quality throughout the range. This room was definitely in the top tier. In the larger lobby-level rooms was more great sound! I am happy to report that Steve Nugent of Empirical Audio in the Iris Room was finally getting a computer audio sound that had me agree with his claim of exceeding CD-level quality. Having reviewed two of Steve’s DACs, I think he finally has all of his ducks in a row. His Off-Ramp 4 (USB interface between computer/server and DAC) had 2 Ultraclock reclockers. The Offramp now licenses M2Tech firmware and drivers for an asynchronous USB interface – a major coup! It was powered by his Monolith LI battery supply. His Overdrive Signature DAC had 10 optional Hynes regulators to add $2250. It was powered by one Monolith for the digital section and two big wall warts for analog. He had a sequence of demo cuts playing from a MacBook Pro. What Steve’s technology does for the music is provide much cleaner sound with crisper leading edges and explosive dynamics. These benefits were clearly heard through the three-way Salk Soundscape 12 speakers. According to Steve, the speakers were not broken in when set up at the beginning of the show but had loosened up significantly by Sunday when I visited. I still could detect a bit of tightness to the sound. I don’t want to neglect the contributions of two other companies to this room: Balanced Power Technologies and GIK acoustic room treatments. What I found to be of particular interest was when Steve demonstrated that his I²S and S/PDIF outputs from his Offramp 4 were now almost indistinguishable. This had not been the case before and Steve was one of the leading proponents of the I²S interface to a DAC. He agrees that I²S is still a hair better but this now opens up his Offramp for use with a wider range of DACs, something one might have felt hesitant about before. 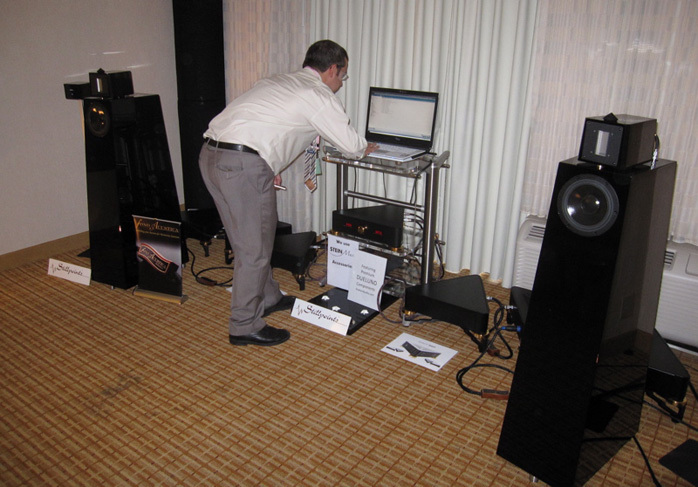 The Larkspur room had Brian Ackerman of Aaudio Imports demonstrate the larger Acapella High Violoncello II speakers ($80,000/pair) powered by Einstein electronics just like last year. 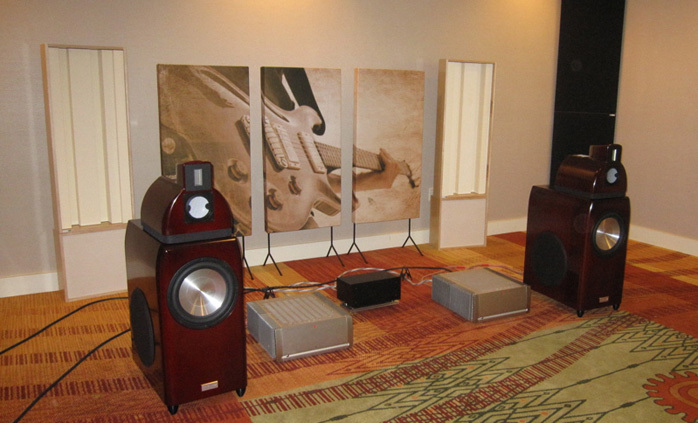 The sound was sumptuous, with vocals being an obvious strength of these speakers. I did not spend as much time as I wanted but heard nothing to suggest that it was not in the same league as last year when I voted it Best of Show.